Remember Arbor Day – plant a tree. It’s good for you, and it brings beauty. This Friday is Arbor Day – always the last Friday in April – a tradition that began nationwide in 1872 and continues today with individuals and groups celebrating trees and nature. Planting new trees and caring for existing ones is more important than ever as we battle exotic invasive insect pests, air pollution, soil compaction and contamination, limited water and nutrient availability and the overall effects of extreme weather conditions and climate change. Trees are much more than just a beautiful big plant; their social, communal, and environmental benefits are numerous. They manufacture oxygen and absorb carbon dioxide. They provide shade in summer and windbreak in winter. The beauty and serenity of trees have been shown to help hospital patients recover more quickly. 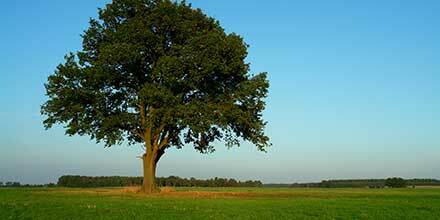 Trees reduce crime in low-income urban areas and increase home property values. Trees save energy, improve air quality, conserve water and provide homes to wildlife. Wallace Stegner left us with books that are relevant and thoughtful. Perfect addition to all the Earth Day celebrations this week and beyond. Thank you to my friend and colleague Christina Carson for pointing me to the literary genius of Wallace Stegner, both author and environmentalist. He’s known for his dedication in writing about the preservation of the West of the United States, but my introduction to him came from reading his novel, Crossing to Safety. I’ve already ordered his Pulitzer Prize winning novel, Angle of Repose because I’m enamored of this gentle man’s prose and honesty in the telling of a compelling story. Isn’t that the standard to which all authors should aspire? I know it’s what I wish for myself. Celebrating Earth Day is a little bit like giving canned goods to the homeless at the holidays as if that’s the only time the food is needed. Same with Earth Day. We get all warm and fuzzy inside thinking about doing things to help the environment, but then May comes along, and we forget that the Earth still struggles under the weight of human weight and consumption, just as the homeless need food as much, if not more, once January 1 rolls around. Here’s something to do year round to help you, the environment, and maybe even those who have less than you do. Food banks welcome fresh produce and making compost surely helps you grow your own. I’ve been composting kitchen waste ever since I had a small rooftop garden in my efficiency apartment in Ann Arbor in 1979. Since then, I’ve composted on a 20-acre homestead, in an urban backyard, and behind the shed in my current home in Pennsylvania. 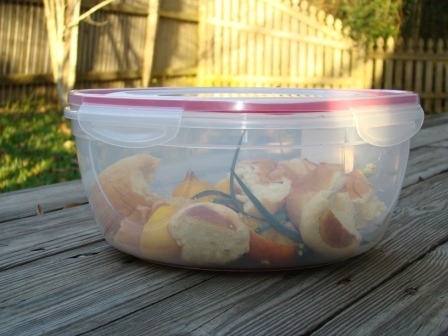 It’s a simple process and begins with finding a container with a sealable lid to keep in the kitchen for the food scraps. Not all of your waste from the kitchen makes good compostable material. Avoid the use of meat scraps, fish byproducts, cheese, bones, fats, oils or grease because they all attract wild animals and take a very long time to break down. Egg shells, coffee grounds and vegetable matter make the best material to start the process of minting your very own black gold. 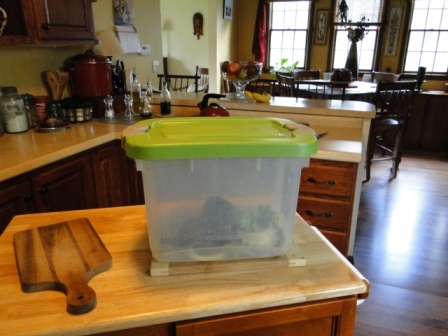 Once the container is filled, take it to the compost bin and put it inside and cover with either brown or green organic material. Making the rich topsoil requires a balancing act between green materials and brown materials placed on top of the kitchen scraps. Think of the green things as those still close to the live stage: grass clippings, food scraps and manures. The browns have been dead for a while and consist of dry leaves and woody materials and even shredded paper. We use the ashes from our fireplace. Layering these elements, with the browns taking up the most space, leads to the decomposition of the materials. Air and water are essential in assisting in this process, but usually there is enough liquid in my compost container and in the air to not worry about wetting the materials. If you notice the material in the bin looks dry, go ahead and water it. There are products you can purchase, from shredders to rotating drums to three-stage bins. You can spend from $50 upwards to several hundreds of dollars. 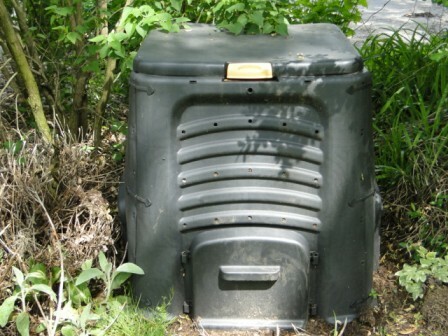 If you live in the extreme north, you may need to invest in the more sophisticated type of equipment to ensure the success of your compost bin. But I’ve composted in Michigan, Florida, and now Pennsylvania and managed to do it successfully without expending lots of money. When I lived in an urban setting in Florida, I did the simplest thing. But it could easily have been expanded. I bought a plastic garbage can for under $10 and cut off the bottom. I drilled holes all over the lid and sides to allow air flow. A nail and hammer would have accomplished the same thing. I dug a hole about three-inches deep in the soil the diameter of the can and placed the bottom into the ground, filling around the sides to make it secure. I covered the bottom with the dirt I had just removed, making sure it was nice and loose. Then I placed my kitchen scraps on top. I covered those with leaves from my yard and put the lid back on the garbage can. Every time I put new material from the kitchen into the bin, I stirred the whole thing with a shovel. 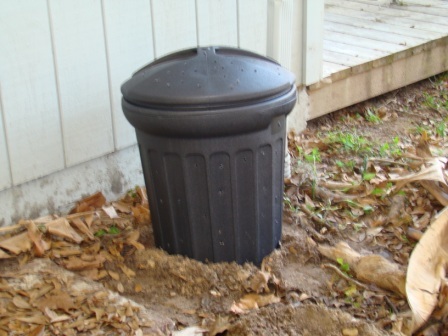 Here in Pennsylvania, we bought a simple compost bin from Lowes for under $50. It has panels on all four sides that slide off for easy removal of the dirt from the bottom. I fill my flower pots full of this healthy rich soil where grateful petunias and pansies thrive in the dirt that started in my kitchen. Our vegetables and herbs will receive a healthy dose of the soil when it’s time, and then we start the process all over again. 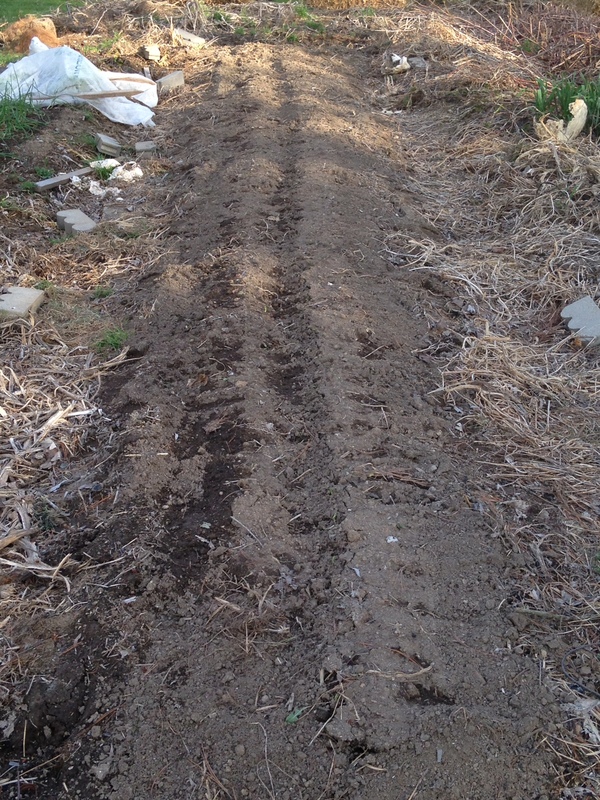 Earthworms are the essential ingredient for turning the scraps into rich dark soil. If I see a worm in the yard, I’ll pick it up and carry it to the bin, but mostly the earthworms find it all by themselves. If you don’t see any in your pile, buy a small container of earthworms from the local bait shop and let them loose. They eat the organic matter, and quite graciously poop behind nice dirt. Maybe that’s what I love most about composting. It’s a way to be a part of the cycle of nature without disturbing or destroying it. When I began pulling together information for my book, From Seed to Table, my copy editor read the part on composted and was amazed that she could very easily start a small pile in her urban backyard. Just be sure to cover all the food scraps and keep a secure lid on the heap or you’ll have wildlife other than earthworms wanting to eat your scraps. Do you compost? What’s been your experience? Any tips or suggestions to add? And in honor of Earth Day and in remembrance of all we lost during Deepwater Horizon, I’m offering an eBook sale (either $.99 cents or free on Smashwords) on my novel Trails in the Sand. This contemporary fiction chronicles BP’s oil spill in 2010 as environmental reporter Caroline Carlisle races to save her family from the destructive forces of their past. Click below to be taken to the purchase site of your choice. Five years ago today I sat in bed reading the morning papers and listening to Good Morning America. A little passing news story took up less than a minute of air time to let us know that an oil rig in the Gulf of Mexico had caught on fire. No big deal. Until it was. Eleven men died in that fire. The environmental effects aren’t over just because the cap was sealed on the gushing fire. Click here for some comprehensive articles from the Wall Street Journal on what is being done and what has been done in the past five years. We know for sure that we lost lives, both human and wildlife. We know that habitats were disturbed. And we know that if full safety procedures had been followed, this disaster might never have happened. Today, please remember what we lost. I wrote my novel Trails in the Sand as an appeal to make sure we never let anything like this happen again. At the time it happened, I worked for the Florida Fish and Wildlife Conservation Commission as a public relations director. 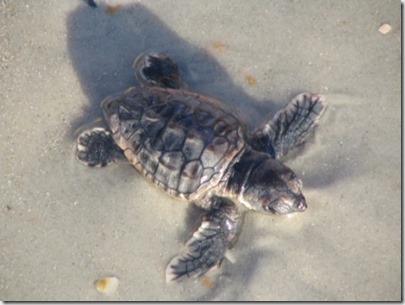 One of my jobs during the spill and subsequent threat to Florida beaches was to head up the media portion of the effort to move sea turtle nests from the Panhandle beaches to the east coast where once hatched, the hatchlings would march to sea in safer waters. I hope they remained safe. 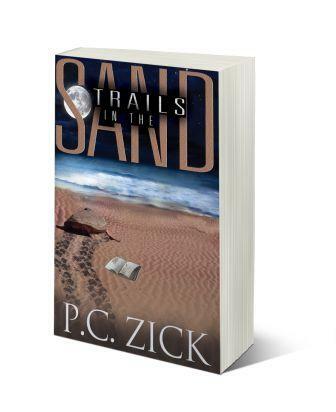 For the month of April, Trails in the Sand eBook is only $.99 cents. Click below to grab your copy. Or download for free at Smashwords, using coupon code FR84H. Tomato plants wait for warmer soil. It’s a rite of spring around our house that my husband begins preparing the soil and putting in the ground onion seedlings and pea sprouts. 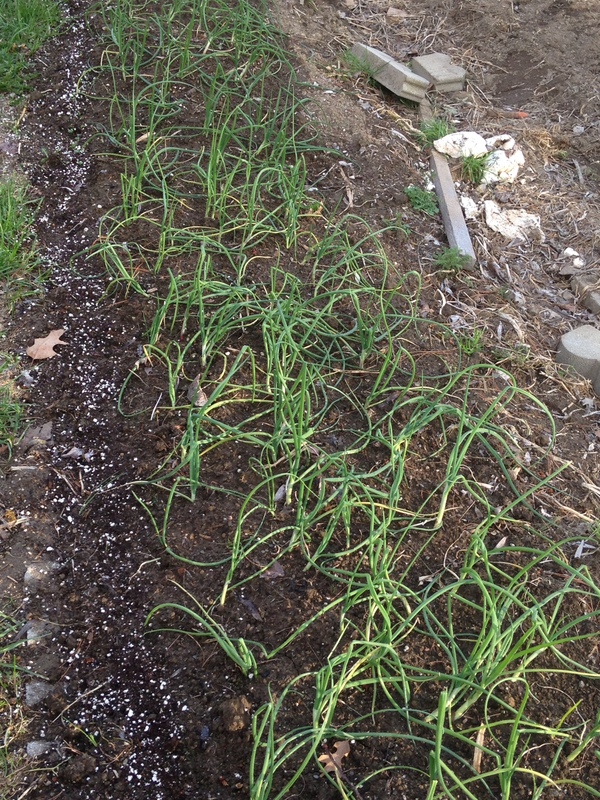 Onions are in the ground. Spinach babies seeking the sun. 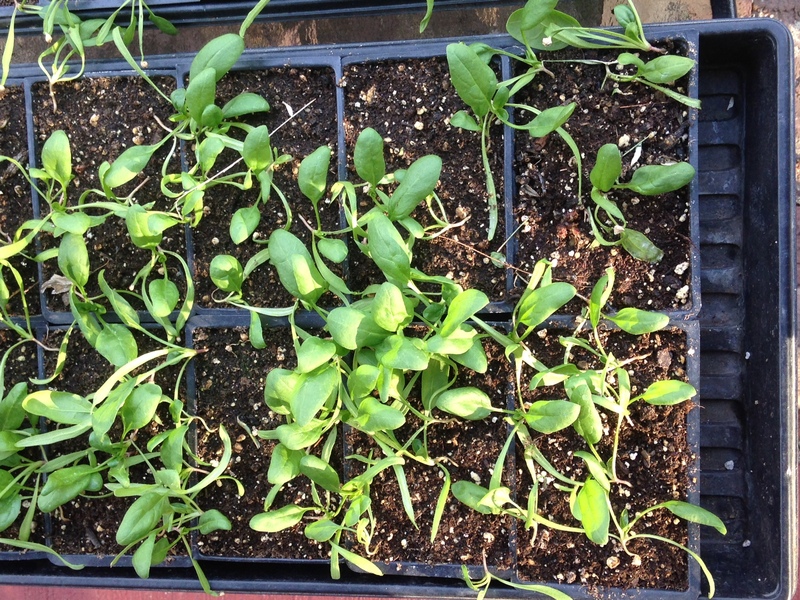 Spinach plants come out from under the grow lights and into the sunlight of warmer spring days. 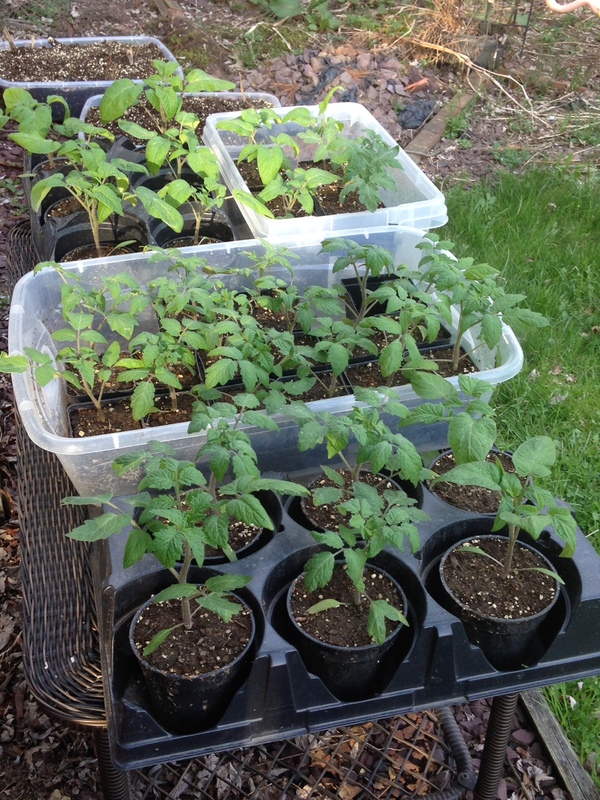 Tomato and pepper plants begin peeping out of the soil in their pots and when tall enough transferred to larger pots, waiting for that day in May when the ground and air temperatures are warm enough for them to stretch their roots into the soil of the raised beds. Alas, this year hubby promised he’d go easy. After all, our house is for sale with hopes for a spring or early summer buyer and move. Hubby’s had a heck of a year health-wise, with the doctors no closer to a solution than they were a year and a half ago. A very large blood clot in his leg that broke off and moved to his lungs put him on the disabled list this past week. That didn’t stop him. The doctors at the hospital said he could do some planting, but they didn’t know that my husband believes the rite of spring planting is his right of life no matter his state. Sunday found him in his garden planting two rows–each fifteen feet–of pea seeds he’d sprouted during the past two weeks. 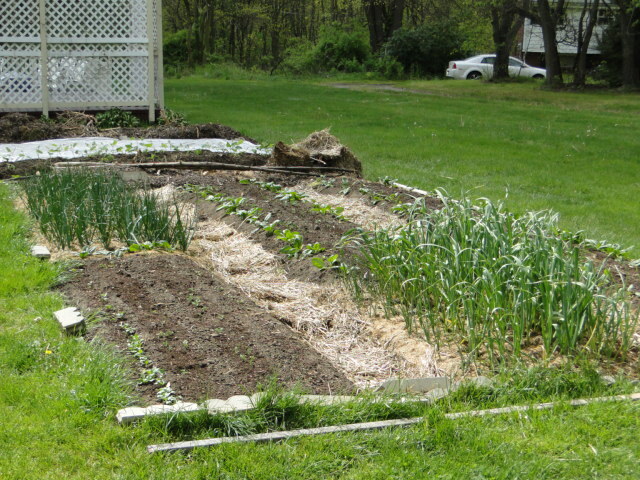 Rows of peas are planted in raised beds. Monday found him in bad shape and a severe lecture from our family doctor has taken not only his right of spring to plant, but his rite of the season is squashed for now. 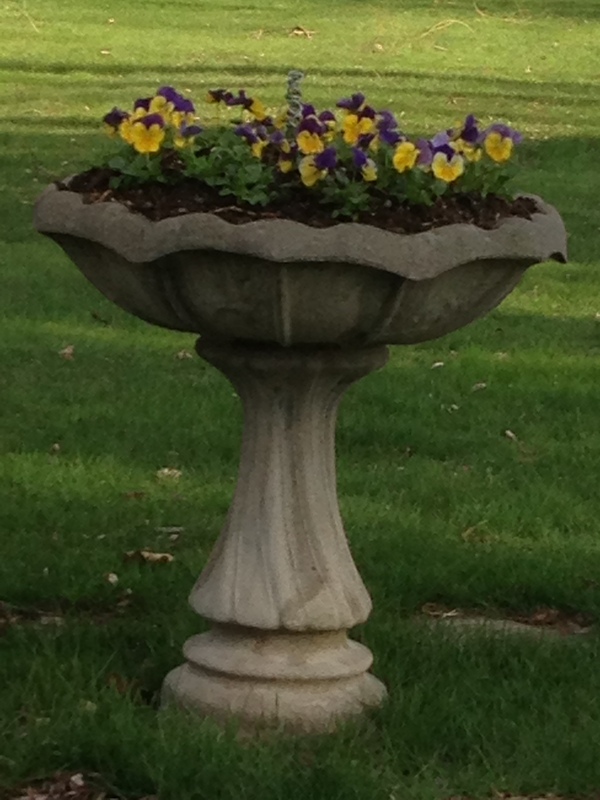 The pansies are my offering to brighten up the yard. Thank goodness or we’d be right back where we started. As the days warm and the daffodils bloom and tulips push forward, we also hope for answers for my stubborn husband with the green thumb. 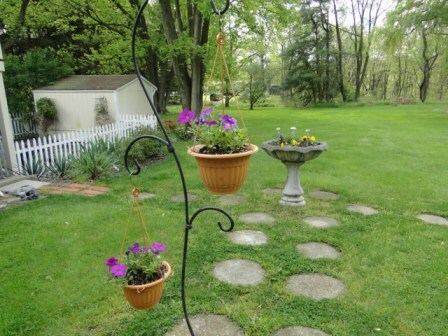 How’s your garden growing this spring? Don’t forget to download or get your paperback copy of From Seed to Table. 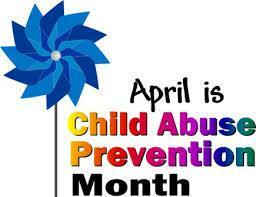 Always remember the children and keep them safe. 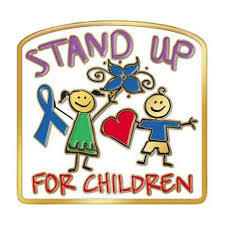 BE A VOICE FOR ALL ‪#‎CHILDREN‬PLEASE SHARE and help raise awareness. In 2013, there were 679,000 victims of child abuse and neglect throughout the United States; more than 10,000 were child victims from Colorado, according to the US Department of Health and Human Services, Administration for Children & Families. In 2014, the Kempe Children’s Center at Children’s Hospital treated 1,306 children for abuse, served 641 parents and caregivers and trained 9,605 child welfare professionals. I woke this morning of Easter thinking of my great grandfather and where he might have spent Easter during his years as a soldier in the Union Army. He makes no reference to the religious holiday even though he was a deeply religious man. However, I found a passage in his memoir, Civil War Journal of a Union Soldier, from April 4-6, 1861, that tells the tale of springtime during war. He and Michigan’s 2nd regiment had been encamped near the Black River, five miles from Newport News Point, Virginia, for almost two weeks. They endured two weeks of almost solid rain before receiving the word it was time to march through the mud to their next camp. Here’s his story of those few days in early April, one hundred and fifty-three years ago. us with all the fierceness of full summer. We crossed Back River and took the road up the peninsula between the York and James rivers. The roads were heavy with mud, and the soldiers were fain to relieve the tiresome march by reducing the weight of baggage carried upon their backs. Believing summer had come to stay, they began to throw away their overcoats, and some their blankets and soon the roadside was literally covered with these castoff articles. The route step of vigorous, fresh troops soon brought us through a wooded country to Little Bethel. We were some surprised to see nothing but a small church, for General [Benjamin F.] Butler’s movements of last June had given the Bethels a place in history. Late in the afternoon, we came upon Big Bethel. Here as before, there was a church though a little larger than the other Bethel. Some deserted rebel earthworks stretched away into the woods on each side of the road, but as there were no rebels about there was little of interest to us. Two miles beyond Great Bethel, we bivouacked for the night, sleeping beside our arms, for it was known that we were very close to the enemy. April 5 – At an early hour, the column was on the move. The men, in high spirits, pushed eagerly forward, the dominant thought being that every step brought us nearer the enemy. The road lay mostly through heavy timber. In the after part of the day, the country became low and swampy and the roads soft, the mud coming often to our knees. The distant booming of artillery freshened our lagging zeal as we came upon higher ground, but a brief delay, during which the sounds of strife at the front became more animated, raised hopes that once more we were to have some practical experience in warfare. As the firing died away, we moved on and soon learned that the enemy had made a feeble attempt to check our advance at Worms Mills. Late in the day, the occasional discharge of cannon sounded nearer, and as we emerged from the woods onto an open plain, we could see the smoke of the guns rise from a dim line of earthworks on the opposite side. That we were within range of their artillery was evident from the shots that now and then screamed over our heads and clipped the limbs from the trees in our rear. Just at twilight, our brigade was moved to the left and camped between the woods and a pool of water. Beside the pool were Professor Lowe and his balloon. As we approached, he was being pulled down from his lofty place of observation, a thousand feet high. This was one of McClellan’s favorite ways of gaining information of the enemy’s movements. As we had experienced a long and hard march, the cooks were ordered to serve coffee with dispatch. Being in a strange locality close to the enemy and already dark, the cooks took water for the coffee from the pool. When the coffee was served, each man, as he took some in his mouth, quickly spit it out again. Everyone declared it bit his mouth so they could not swallow it. Investigation showed that they had taken the water from the same spot where the refuse vitriol used in manufacturing gas for the balloon had been emptied. A storm of indignation was raised against the cooks and some curses were hurled at the balloon, but I doubt any of us could have done better under the circumstances. We were now before Yorktown and on the border of the plain where Cornwallis surrendered his forces in Revolutionary times. Yorktown is a walled town of the old style to which the rebels added a long wing of earthworks that entirely covered the available route up the peninsula. After eating the remnant of food in our haversacks, we lay down with the thought that on the morrow we should surely assault the enemy and severely punish him. April 6 – With the dawning of a new day, the encampment was astir, anxious to get a glimpse of the surroundings by daylight. The first object that met my gaze as I crawled from my shelter tent was the forms of General [Hiram G.] Berry and two staff officers stretched upon the bare ground under a tree, without other covering or shelter than its spreading branches while their horses gnawed at neighboring saplings. The baggage train that should have brought the general’s tent and equipage and our rations, had been delayed by the bad roads. The prospect for something to eat was dubious. The majority of the men had eaten the last from their haversacks the night before. Roused by the bustle of the camp, the general and his aides arose and kindled a small fire and put something to cook in a quart cup. Three of us who messed together pooled our rations and found we had six hardtack for the three. We voted to give the general and each of his aides one apiece and have one each for our own breakfast. Upon tendering them to the general with the information that it was half we had, he accepted on condition that we take half of the rice they were cooking which was all they had. It was a great consolation to us that for once the general and his soldiers fared alike. Notwithstanding our eager expectation, the day passed without any action. The next day and the next passed in inactivity and no rations. April 8 – The troops were moved back into the woods and picks and shovels came to the front. Our spirits were dampened by the prospect of more shoveling. For many days, camp life was broken only by the regular rotation of picket duty and an occasional turn at shoveling in trenches, which were to form a regular approach by means of parallels to the enemy’s works. The camp of our brigade in the woods lay between two swamp holes, the waters of which we were compelled to use for washing, cooking, and drinking purposes. Very soon around the entire edges of the ponds was a wide circle of dirty soapsuds where the men had washed their clothes and their persons. Water to drink was procured by walking as far out as possible on a log and dipping up the filthy swamp water, and even there it tasted of soap. We knew of no better water, and if we had perfectly patrolled, that if a man strayed from his own camp, he was sure to go to the trenches to work instead of finding water. Drenching rains fell most of the time, rations were scarce, and the miasma of the swamps sickened the men so that our ranks were depleted faster by disease than they would have been by assault upon the works at Yorktown. At intervals through all these days, the rebels sent shot from their heavy guns over us and around, but nobody was ever hurt by them. Working parties pushed the fortifications day and night under the direction of experienced engineers. By day, the work went on behind the woods and in other places out of rebel observation and by night parallels were dug across the open spaces by the aid of white lines. Each morning, the enemy awoke to find some new piece of Yankee impudence right under their noses. force could throw out the remainder at night without the aid of lights. With a wholesome respect for the frowning guns before us, we did not draw a single shot from the rebel batteries. I came on duty once with a captain of the 3rd Michigan. After lookouts had been posted and everything was arranged for the night, the captain and myself wrapped our blankets around us and lay down on the shelf of the trench, feet together, while the other men were disposed conveniently near. In the night, a big shell buried in itself in the breastwork near the point where our feet met, and burst, sending a great amount of dirt into the air. As the earth came down, it buried both under a heavy load. With some exertion, we both released ourselves and met in the darkness, he being sure it had torn him to pieces. Investigation showed that no one was hurt, and we returned to our slumbers to be disturbed no more that night. Time brings all things to an end and at last the earthworks were completed, the cannon and mortars mounted, and it was currently rumored that the bombardment would take place in a day or two. Our sharpshooters were so close to the walls of Yorktown that they could pick off the gunners whenever they attempted to serve their guns, and their keen eyes were always strained to detect an animated mark for their aim. Civil War Journal of a Union Soldier by Harmon Camburn as presented by P.C. Zick is available at the following locations. Click below to purchase.